Making wine in only five days is now possible with the Cantina wine kits. Start it on Monday, drink it on Friday. 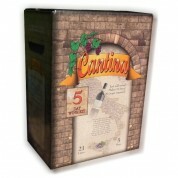 Cantina wine kits contain all ingredients you need, just add water to make 21 litres of your own wine! Thanks to the development of new very highly specialised yeast nutrients, it is now possible to make your own wine in only 5 days and still retain all the qualities of the grape raw material, producing a perfect Italian wine. You don't need to be an expert, just mix the ingredients and wait!